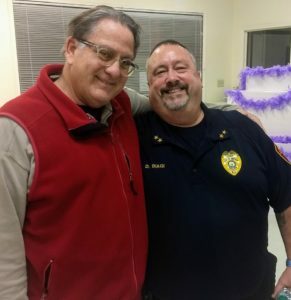 Ventnor Police Chief Doug Biagi, right, with Ventnor resident Jim Touhy at a town hall meeting held Tuesday, March 19 at the community center. VENTNOR – Attending a town hall meeting with the city’s top law enforcement official is somewhat like comedy night at The Improv. Police Chief Doug Biagi brought his two-hour stand-up comedy routine to the people of Ventnor at a public session held Tuesday, March 19 at the Ventnor Community Center. 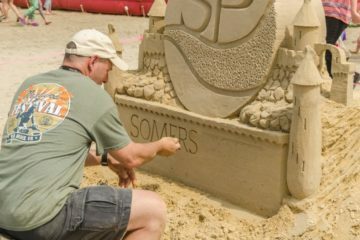 The event, which was organized by the city’s Democratic Club as a community service, featured Biagi, a 33-year veteran of the Ventnor Police Department who was born and raised in Ventnor. His presentation included statistics about crime in Ventnor interspersed with one-liners only Biagi could deliver. Residents laughed and applauded at Biagi’s jokes, which delivered a serious message about the forever-changed demographics of a city sandwiched between Margate and Atlantic City: “We all need to be more patient and nicer to each other,” he said. “I remember when there was one Black family in Ventnor. Then the casinos hit, and it was an explosion of demographics and it’s now like New York City that in our 1.7-square miles we have every race and creed represented. You name it, we’ve got it and we all get along and make it work,” he said. Despite the diversity, there are very few hate crimes in Ventnor, he said. 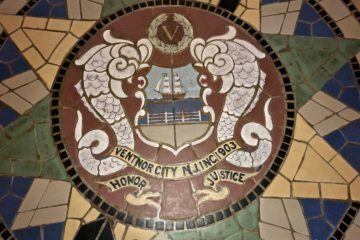 Three murders last year, including a double-homicide, and a random shooting on New Year’s Eve are not the norm in Ventnor, he said. The department is down one officer since last week when one longtime officer was indicted in a compounding pharmacy scheme. “We ran an all-time high of 42 officers, which lasted for a few minutes, but now we average 35-36 officers and a fully-staffed dispatch center which reflects in our short response time, about 1.5 minutes,” he said. The department is as diverse as the people it serves, he said. Being a police officer is the toughest job in the world and laws are passed that are often difficult to enforce, “but we deal with it,” he said. The biggest change in policing over the years has been technology, he said. “Once computers and phones came out with cameras on them, and the Internet has changed everyone’s life. Now everyone wants to be a Steven Spielberg or a TV news anchor making commentary. Everyone wants to get their two-cents in, but nobody cares about the truth anymore,” he said. The department now has body cameras for every officer that show adults often live in “a different reality” and will do anything, including lie, to get themselves out of trouble or getting a ticket, he said. “Video cameras are the best thing to happen to law enforcement. It gives us a real picture of what’s going on out there. These cameras are not to show our guys doing bad things, but what the world is doing bad to each other,” he said. The New Jersey Attorney General’s Office and Atlantic County Prosecutors Office provide police with guidelines to follow when responding to calls, including step-by-step procedures that ensure victims are treated with compassion and the accused party is treated appropriately, he said. Laws come on the books because people don’t pick up after themselves, he said. Biagi said juvenile crime involving Ventnor children is virtually non-existent and the kids that are committing crimes are coming in from other towns, he said. He advised residents to be vigilant, so they don’t become victims. And he recommended they call 911 if they notice anything suspicious going on in their neighborhood. “You are the eyes and ears for us. Don’t stop being nosey neighbors,” he said. The department got more than 18,000 calls for service last year, a majority of which involve domestic violence issues fueled by drugs or alcohol. Biagi said there’s an uptick in domestic violence incidents around the holidays, and even though the town swells from 10,000 people to 30,000 during the summer season, there is no uptick in crime in summer, he said. “It’s not the shoobies that are the problem, the problem is us,” he said. The biggest problems in summer are irritated year-round residents upset because they can’t find a parking space near their homes, he said. “People as a whole, have forgotten how to have a conversation, and now it falls on the police department. We have to be a little more patient and learn to be a little nicer to each other,” he said. 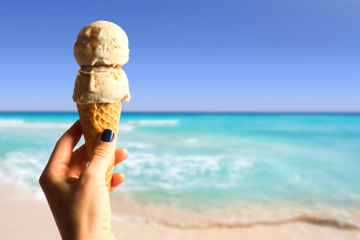 Residents questioned bike riding on the boardwalk, which he said, he would like to see banned totally in the summer because it is just too dangerous for the elderly strolling the boardwalk, and how the police would enforce the ban on smoking on the beach. Biagi said the city would soon be painting bike lanes on Atlantic Avenue, which will provide a safer way to bicycle during daylight hours, and the city will be dropping the speed limit on Atlantic Avenue to 25-miles-per-hour from the current 35-miles-per-hour to match speed limits in Margate and Atlantic City. The opioid crisis has hit Ventnor as bad as it has in other cities around the country, he said, and that addiction picks its victims randomly. “It doesn’t matter how wealthy you are,” he said. Ventnor was one of the first Atlantic County municipalities to mandate police and firefighters carry Narcan. The big takeaway to the session was that residents should call police when they first experience a problem. “It does us no good the next day when your neighbor’s house was burglarized and we knock on your door and you say, ‘I though I heard something last night, but I didn’t think anything of it,’” he said. Police are available to help mediate problems, especially between neighbors. Regarding enforcement of the beach smoking ban, Biagi said police would enforce it, because it’s the law. “We’ll arrive in a clown car and use seltzer spray,” he said. Resident Marlene Armstrong said she enjoyed Biagi’s presentation.